April is month of the gerbera and today we introduce our gerbera campaign 'Get the Feeling'. 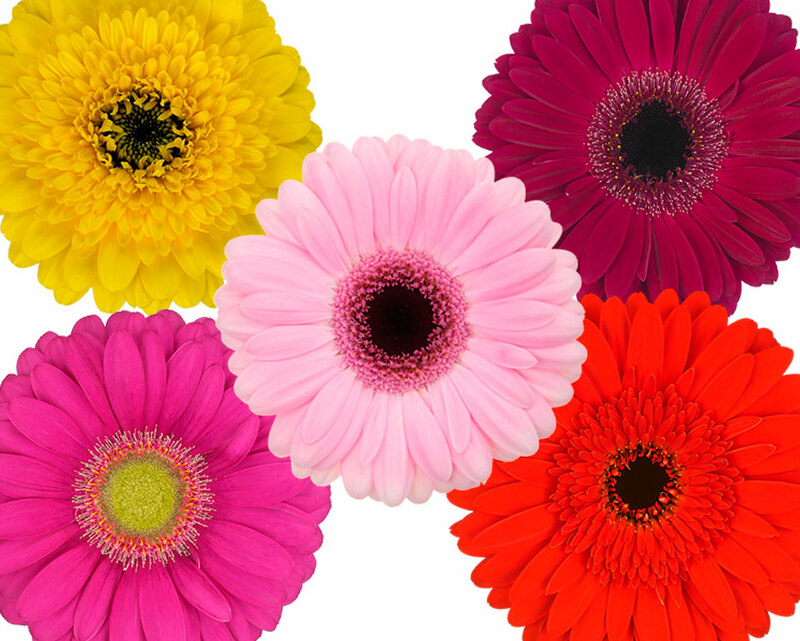 Gerbera is a flower that excels in diversity and colour, making almost anything possible. Each and every emotion you wish to share, say it with the gerbera. The aim of the campaign is to bring the diversity of gerbera to the attention of wholesalers and florists in Germany and the Netherlands. The campaign will take place from 1 to 14 April 2019. On the 7th and 8th of November twelve international florists competed against each other to win the Wim Hazelaar Trophy. Spread over different assignments the florists created seven floral arrangements. For one of the assignments the contestants had to create a floral party using gerberas. The gerberas used for these creations were sponsored by Coloured by Gerbera. Trade Fair Aalsmeer is drie dagen lang hét epicentrum van de sierteeltsector. Van 7 t/m 9 november biedt Royal FloraHolland met deze beurs ruimte aan kwekers, veredelaars en handel om de laatste ontwikkelingen te presenteren. Ook Coloured by Gerbera is vertegenwoordigd: hal 1, stand 8.16. Tuesday the 2nd of October the Pyramide event ‘Out of the Box’ took place at the Floral Shopping Centre located at the grounds of FloraHolland. It’s an event designed for florists to get informed, inspired and to get into contact with different growers and breeders. The gerbera was greatly represented at this event. Of course, Coloured by Gerbera was present to get into personal contact with the florists that attended the event. Recently the fourth edition of the Italian event Spritz & Flowers took place. The annual party in the birthplace of the popular drink Aperol Spritz: Jesolo. The aim of the event is to bring consumers to the attention of the drink. Op 21 juni gaat de zomer officieel van start. Mensen maken hun huis al klaar voor de zomer. Een trend die we deze zomer zien is dat de woonkamer wordt verlengd in de tuin. Er wordt buiten een huiselijke sfeer gecreëerd en mensen genieten samen met familie en vrienden optimaal van het buitenleven. What's the first thing that pops into your mind when you think about summer? Enjoying sunny days at the beach, having a picnic in the park, travelling to sunny destinations. Flowers have the power to deliver this summer feeling, especially the colourful gerbera. Therefore we've created a new inspiration magazine. During the Flowershow at Keukenhof our growers presented their gerberas. Leading flower arrangers from Heleen Valstar BV created a unique show at the Orange Nassau Pavilion with our colourful gerberas. Every year we travel to a place where we can bring colour and joy with our Dutch gerberas. This year we travelled to beautiful Switzerland and visited Grand Hotel & Spa Victoria-Jungfrau. An amazing location for private- and business events. We combined our visit with a trip to the lake of Brienz and the mountains of Grindelwald. Result? A new gerbera inspiration magazine in a Swiss setting. We are proud to present you our new gerbera assortment brochure. Today, this brochure will be officially launched during Floradecora in Frankfurt, the market place for fresh flowers and decorative plants. Let's meet at Floradecora 2018! This coming Friday, Coloured by Gerbera will be present at the Floradecora 2018. We will show you a lot of gerbera varieties intended to inspire you. Of course, you can chat to our representatives and growers.